ANTANANARIVO: At least 16 people were killed and 10,000 forced from their homes when Cyclone Giovanna pounded Madagascar, the disaster management bureau said Wednesday as it continued assessing the damage. The storm struck in the early hours of Tuesday, lashing the towns of Tamatave and Brickaville on the east coast before drenching the capital Antananarivo about 220 kilometres (135 miles) inland. 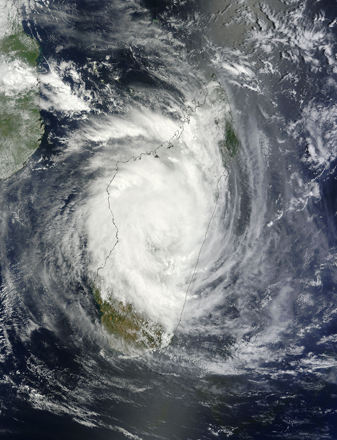 By Wednesday morning, the storm had passed over the vast Indian Ocean island nation, leaving one person dead in the capital, eight in Brickaville and seven in Moramanga, 114 kilometres east of Antananarivo, according to officials. The disaster management bureau said the death toll could still increase. Of the 592 communities hit by the storm, contact had been restored with just 80. Damaged rice is seen in a paddy field destroyed by flood- waters near a village in Manmunai West in Batticaloa district, about 199 miles east of Colombo, Sri Lanka, on Jan. 26. The floods inundated rice paddies, and according to the UN Food and Agriculture Organization, at least 15.5 percent of the main annual rice harvest could be lost. Global food prices reached a historic high last month, a fact that may cause even the most comfortable of Americans to cinch in their belts and cut back on spending. But what about the world’s poor?